The staff at the Elkins, West Virginia clinic are some of the finest in their field. Most have over 15 years of experience, with nearly no turnover or patient complaints, and a spotless record of CMS audits, Clinical Manager Jeanine said. But the Fresenius Kidney Care motto "thrive on" was especially true this year when cancer, multiple sclerosis (MS) and methicillin-resistant staphylococcus aureus (MRSA) afflicted three of the five patient care technicians (PCTs) on staff. Determined to provide the same high standards of care, staff members and administrators put in extra hours and relied on their strength as a team to get through the year. Last year, six-year Elkins veteran Helen was diagnosed with breast cancer. Weeks later, 24-year-old Jacob was diagnosed with MS, and Stephanie, a diabetic, developed MRSA after suffering a foot injury. Cathy and Dee were the only remaining PCTs, and in dedication to supporting their team, they worked 12-14 hours a day every day. But even cancer and MS couldn't keep Helen and Jacob away. 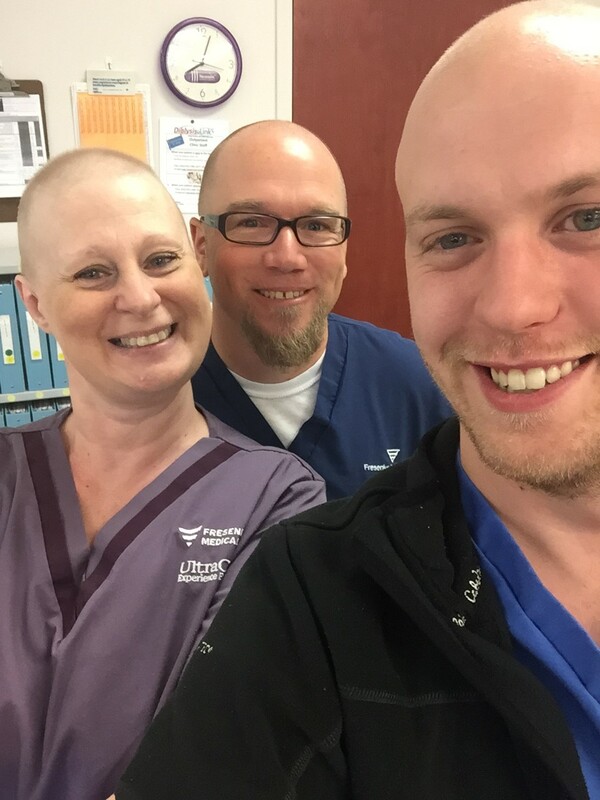 After chemotherapy and radiation treatment, Helen returned to work, living proof that "bald is beautiful," Jeanine said. And Jacob, after two weeks in the hospital and beginning physical therapy, was back to work and "firing on all cylinders." Sister facilities and Amanda, Director of Operations, gave much needed support and allowed the team to hire extra temporary help. But the greatest gift of all was to have the team back together again. "The thing that really warms my heart is to see how happy Helen and Jacob are at work," she said. The team, nearly complete again, is stronger than ever and waiting for Stephanie to recover and return to work. "We are going to thrive and be competitive as a company," Jeanine said, "but on a smaller scale, we will overcome difficult barriers that occur in our lives and work together to persevere." Our care for our patients is only as strong as the care our team members show each other. With team support and positivity, the Elkins staff continues to thrive and deliver five-star care to their patients. Check out PCT openings in your area.